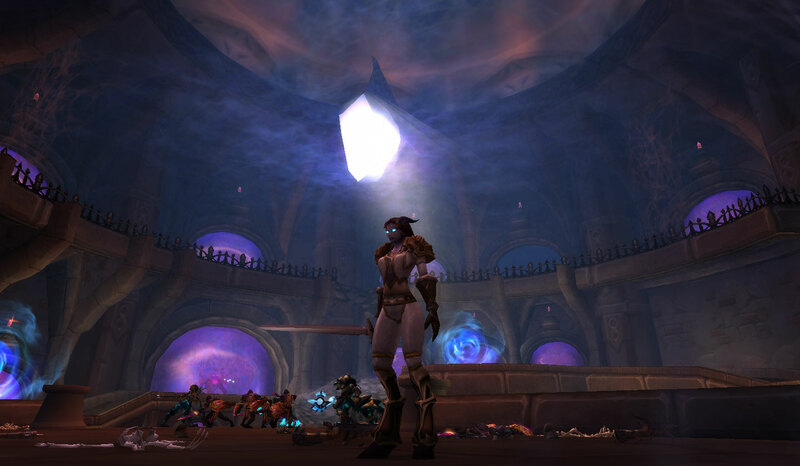 Vault of Light: Alt Appreciation Week One - Death Knight. Alt Appreciation Week One - Death Knight. When Wrath of the Lich King released I created a Death Knight just to try out their new starting area which I loved but I already had my main and a few other alts I wanted to level long before I leveled a Death Knight. They soon started creeping into dungeons and heroics and each one I came across seemed to be worse than the last. They had a terrible reputation being dubbed the new "huntard". I'll admit this put me off playing one for a while, I wasn't sure if this meant they'd be complicated given that so many people seemed to be struggling with them. I eventually made myself a Human female DK with the intent of actually leveling her now that all of my other characters were at max level and I fell in love with the class pretty quickly! I got her to level 80 during Wrath. However my guild decided to transfer over to horde side and I wasn't willing to pay to transfer her along with my Priest and Druid. She didn't have anything worth holding on to her for and I hated her face. I don't like the way that the DK eye glow looks on Human females. Since DK's start at level 55 I deleted her in favor of leveling a new one on Horde and I'll admit that I was much happier with her as a Blood Elf! I've since leveled a further two Death Knights who are both on Alliance although none of them have made it to 90 yet. I was leveling one with a friend who plays WoW on and off every six months or so as she has a little baby so my little 85 DK is waiting patiently for her Mage's return. All four of my DK's have leveled as Blood I really enjoy the style of tanking and I'm not a huge fan of melee DPS. My only gripe is being forced to play though the DK starting area unable to leave. After doing it so many times it's beginning to grate on me. This is similar to the Goblin, Worgen and Pandaren starting area's. Let me level where I want to, god damnit! I like that they're all a bit different too! With them being 75, 83 and 85 their normal gear is a horrible mess so they had to be mogged asap! I absolutely love reading how people started, why they like or don't like and all these small stories that each and every small character that we ever make actually has to them. :) The transmogs look amazing! Aye, I've loved reading all of the participants, really looking forward to the coming weeks and also discovering so many new blogs I wasn't aware of! I'm really glad when I started my blog that I didn't create a gold making blog like I had originally planned. I wouldn't be able to take part in this kind of thing if I had! Thanks for thinking it up!